While there are plenty of individual results for Matt Drudge to get excited about (or for that matter the Huffington Post), the fact is that the overall trend in this election is roughly flat, and has been for about a week or so. That is bad news for the candidate trailing in the race, which in this case is John McCain. 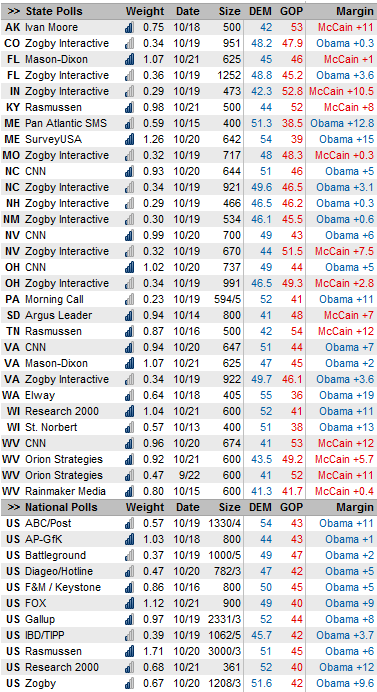 Five of the eight tracking polls moved toward Barack Obama today; the other three moved toward McCain. It's possible that there was a very slight shift in momentum toward John McCain last week, and that it's been counteracted by a similar shift toward Barack Obama after the Colin Powell endorsement. It's also possible that we've simply been reading too much into what amounts to statistical noise. Either way, our Super Tracker thinks that Obama is now no more than half a point off his peak numbers, which were realized earlier this month. John McCain needs to begin closing these numbers, and soon. There are lots of numbers to pick through that the state level today, but few of them are wholly surprising. CNN gives Barack Obama a sizable lead in Virginia, and Mason-Dixon -- one of the few pollsters to call the state for John McCain before -- now gives Obama a smaller one. On the other hand, Mason-Dixon is the latest pollster to have Florida tightening. We suddenly have a flood of West Virginia polling, and most of it suggests that the state isn't likely to flip. For that matter, however, one of McCain's reach states -- Maine -- does not appear to be tightening. McCain does get some decent results in the set of Zogby Interactive polling -- which, unfortunately for McCain -- you should probably take no more seriously than this one. We could stand to get some fresher numbers from Pennsylvania, but Morning Call has been running a tracking poll there for about a month now, and McCain hasn't been within single digits since roughly the 1st of the month.